In Google Analytics, the Previous Page Path shows what page was visited just before the current Page, but Next Page Path seems to be broken or not working. The problem is that it doesn’t hold what the name implies. 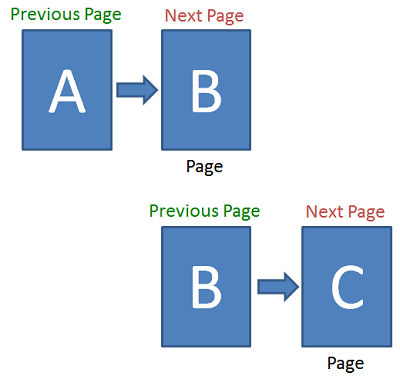 Back in 2009, Nick Mihailovski of Google explained that you should not use ga:pagePath (Page) with ga:nextPagePath (Next Page Path) together — while it works in some situations, the system was not designed with these combinations in mind. It was designed so Previous Page Path and Next Page Path would be used in combination to show how traffic moved from one page (previous) to another (next) — for the navigation reports. The Page dimension was to be used with other page-level dimensions and metrics. Using ga:previousPage and ga:nextPagePath in the same query will report back, “The total times pageview A happened immediately before pageview B in a visitor’s session” If you are familiar with the User Interface, this data is used to present the Navigation Summary report. When Google released v5 of Analytics in 2011, they made a small change that allowed the Page and Previous Page Path dimensions to be used together, but that made the Next Page Path the same as the Page dimension, and caused the confusion that continues today. Google has done little to explain themselves in their help documentation, and describing the Next Page Path as the “destination page” doesn’t really help much. So the root of the problem is that they really only track the current page view and where the visitor came from; the previous page. The label of a ‘Next” page is misleading. The real question is why the “Next” page path dimension even exists in the interface at all today. It only leads to confusion. Update: 2015-07-23 Google Analytics has deprecated the Next Page Path dimension; they now say to use Page Path instead. Bottom line: In Google Analytics, Next Page Path is NOT the next page. Tweet this! 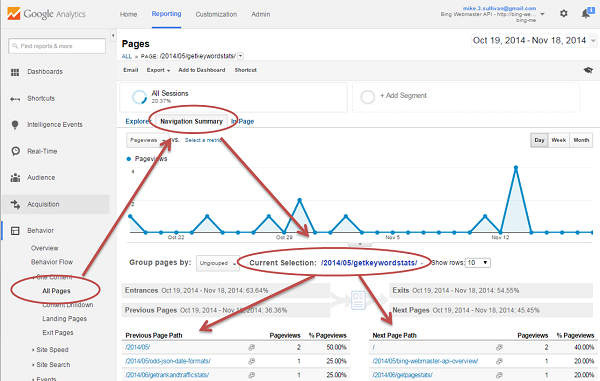 So, how do you build a report that shows where visitors went to from a specific page? In Google Analytics, you can see this pairing of previous-next queries in the All Pages report; Navigation Summary tab. In the API or Custom Reports, we have to use a bit of reverse-logic — create a query using a filter where the Previous Page Path is our page of interest, and report the Next Page Path (or Page) with the metric Pageviews. Sounds a little backwards, but that is how the Navigation Summary report works and is the only way to get the information we want.